Prime Minister Tayyip Erdogan on Saturday evening into Sunday morning had police deploy water cannon and tear gas (some say laced with pepper spray) to clear Gezi Park of protesters and tents, after it had been occupied for a couple of weeks by those protesting the decision to cut down its trees and build a mall there. The heavy tear gas left many gasping for breath and taking refuge in a nearby hotel lobby, where many vomited because of the strength of the chemicals. Police also fired tear gas into the lobby; in encloses spaces, tear gas can be lethal. Ironically, tear gas cannot be used in warfare because of the convention against chemical weapons, but it is used on workers and civilian protests by governments all the time. Bahrain has innovated in heavy use of tear gas to suppress its own Arab Spring protests, and Turkey is now using similar tactics. The Turkish protests mushroomed into a nationwide dialogue on police brutality and the authoritarian and increasingly moralistic tone of Erdogan’s government. Five persons have died and some 5,000 been injured in the government’s repression of the movement. The Gezi Park group remained nonviolent. 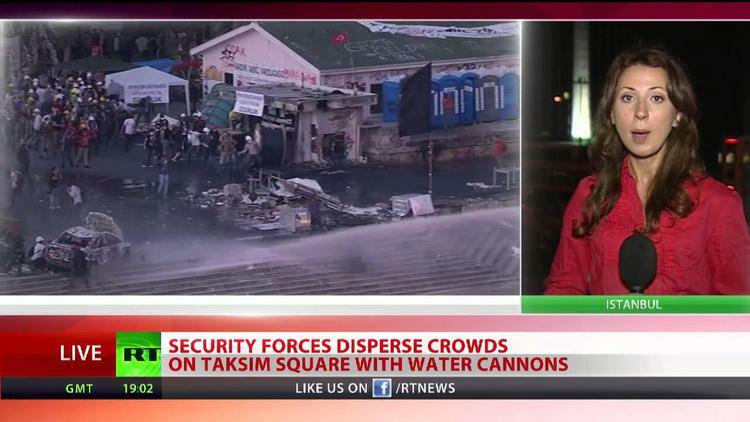 Protesters at nearby Taksim Square included some radicals, a handful of which engaged in violence, and the government has used a few unfortunate incidents to tar the entire movement with that brush. Erdogan had met with the protesters on Wednesday, and has been talking about subjecting the decision on the park to the courts or even a municipal referendum. Erdogan addressed a gathering of his supporters on Saturday, who predictably rallied to his hard line on protests. (Sometimes his crowds chant “padişah,” ’emperor’ at his rallies). He has been talking in an aggressive and frankly somewhat paranoid way about the protesters, implying that they are tools of foreign powers or part of a domestic conspiracy. Had he just promised a referendum and left the whole thing alone, the protesters would have likely drifted away. This way, he wins absolutely in the short term but creates lasting bitterness and polarization that could detract from national stability. To be fair, the US government would almost certainly behave in this situation exactly as Erdogan has. The possibility of street clashes on Sunday between pro- and anti- Erdogan groups has been heightened. Among the disturbing conclusions about the immaturity of the Turkish democratic experiment forced on observers by these events is that the country largely lacks the kind of press freedom essential to genuine democracy.